It’s amazing that food can taste this good even when THIS healthy! Making the right choices when it comes to food should be easy, fun, and experimental. Mike (Dr.T) & I have have enjoyed this journey because it forces us to come out of our comfort zone by going from what we normally make, to making things we would have never even thought to have tried on our own. Some of the veggies that are called for in these recipes are things I’ve never tasted, let along never even heard about. Did you know raw fennel looks like celery, but tastes alot like black licorice? Weird huh!?! But SO MUCH FUN stimulating our taste buds! Want to lose 3-7 lbs per week and don’t know where to start? Attend a free educational seminar Tarjoman Chiropractic on weight loss and the path to a healthier YOU. This will be your last diet and you will feel better than ever!!! Thursday September 6th, at our office, time will be around 5pm, and should last about an hour to an hour and a half depending on questions. Please call (949)829-8871 or email tarjomanchiropractic@yahoo.com to reserve your spot. Space is limited! It’s official, we have started our Ideal Protein Weight-Loss Center. First group of clients have all signed up and starting their program. We are very excited and are looking forward to helping all of them acheive their weight loss goals. This is the last diet they, or you if interested, will every try. 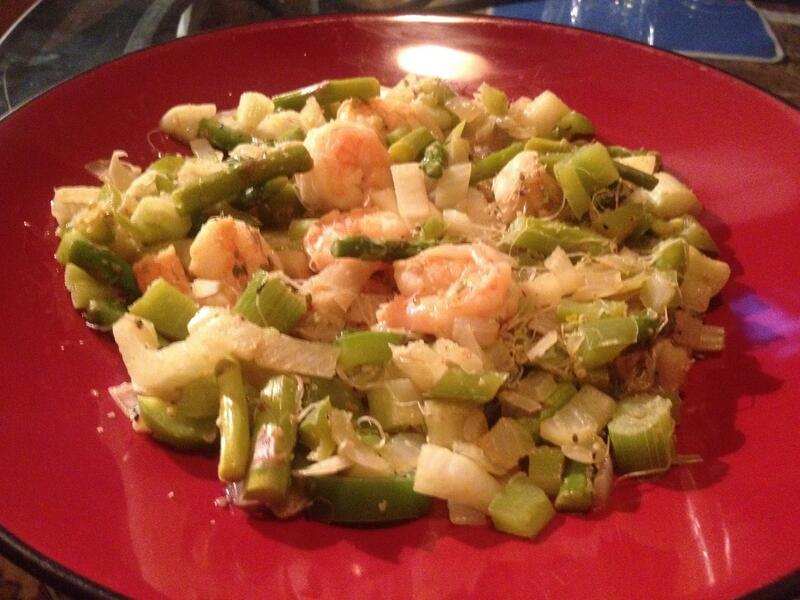 Day 14 – It took me two weeks on Ideal Protein to lose 15lbs. Now, I am off to phase II, which means I’m on my own for dinner & lunch, I have to make my own protein.. Energy is still great, I’m feeling good and HEALTHY! Also, I just wanted to let all our dieters know that I am very proud of you guys. You have done great! Our men have averaged 7.5 lbs of fat loss per week, and our ladies have averaged 4.5 lbs of fat loss per week. Keep up the great work! Day 7: I have lost 10 lbs in one week!!! I am, obviously, very happy with the results. I’ve noticed the little belly that I had prior to the diet I really no longer have, which is GREAT because I’ve always had such a hard time getting rid of that, even after working out for HOURS… I may have another 5lbs to lose right below the belly button and love handle area, but am sure that will be gone very soon. Ladies, please don’t get discouraged and remember men tend to lose a little more per week, because they have more muscle mass. Good luck to all our dieters this week. Stay strong and keep your eyes on the finish line! We can do it!!! Ok, so halibut has always been one of my favorite kinds of fish, & when I made this dish, it just reconfirmed everything. 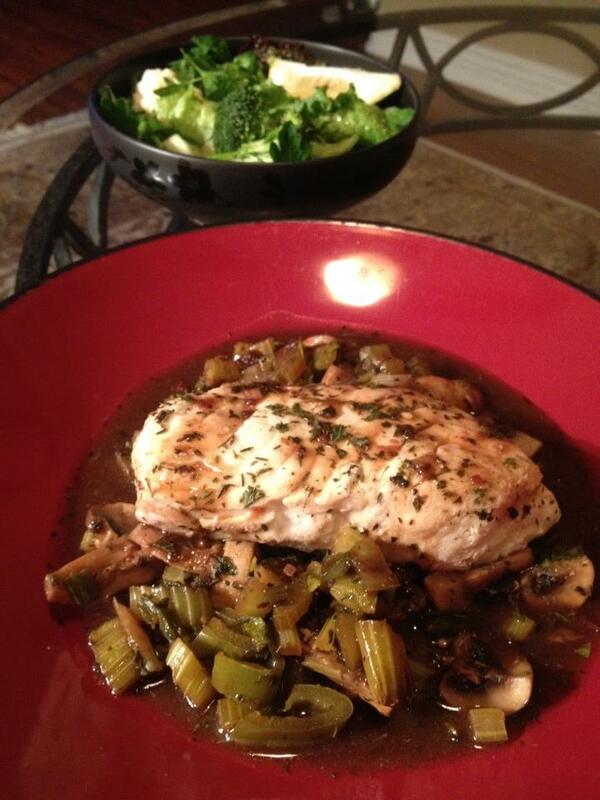 Ideal Protein calls this recipe Halibut Marengo Style – I call it Halibut Daniella Style!!! (Because we were lacking in ingredients, & I was feeling creative) OK, sooooo how to make it… We spoiled ourselves and bought two REALLY nice Halibut Filets from Whole Foods… which, by the way, is one of the best places to shop for produce and meats/fish. Why!?! Because the majority of it all is Organic and all their meats are humanly treated and fed diets that they are naturally supposed to be eating. That’s a completely different tangent that I could go on and on with, but I will spare you, and maybe post something about it on another blog. Back to the halibut… I seared both sides of the halibut for 2 minutes in a little bit of olive oil, then placed the halibut to the side on a seperate dish to make the sauce. I took a bunch of cut mushrooms and browned them in the same pan that I seared the halibut in. Once the mushrooms were brown I added the green onions, green hot peppers, and celery and sauteed until everything was tender. I then put about a cup of Walden Farm’s Sun Dried Tomato Italian dressing with some added basil and cooked all together for a couple of minutes… I grabbed the halibut that I set off to the side and place on top of the ‘stew’ like concoction that I just made. I cooked covered for 4 minutes, then flipped it and cooked other side of Halibut for an additional 4 minutes. I added thyme, parsley, salt and pepper for taste, took off heat and let sit covered for 10 minutes. 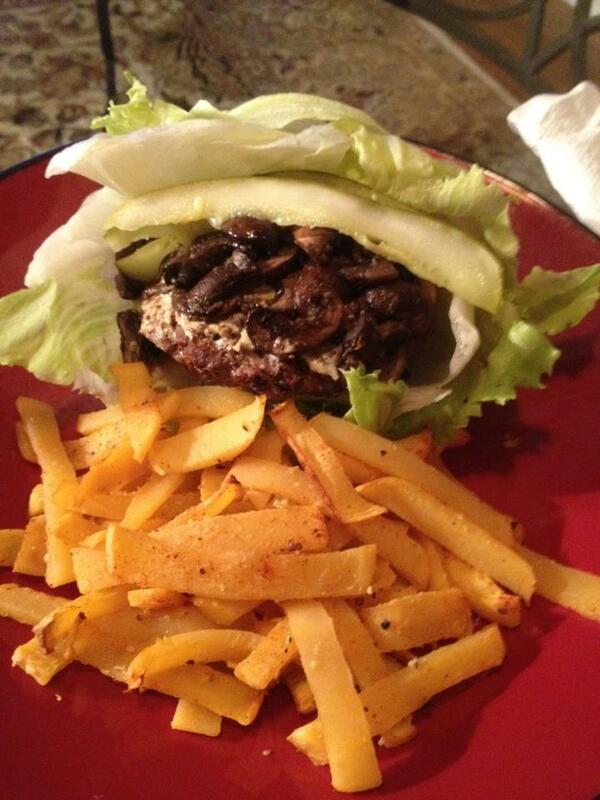 Once done soaking up the flavor, I served like picture above… don’t forget the side salad! Delishhhhh! Ahhhhh MAN! 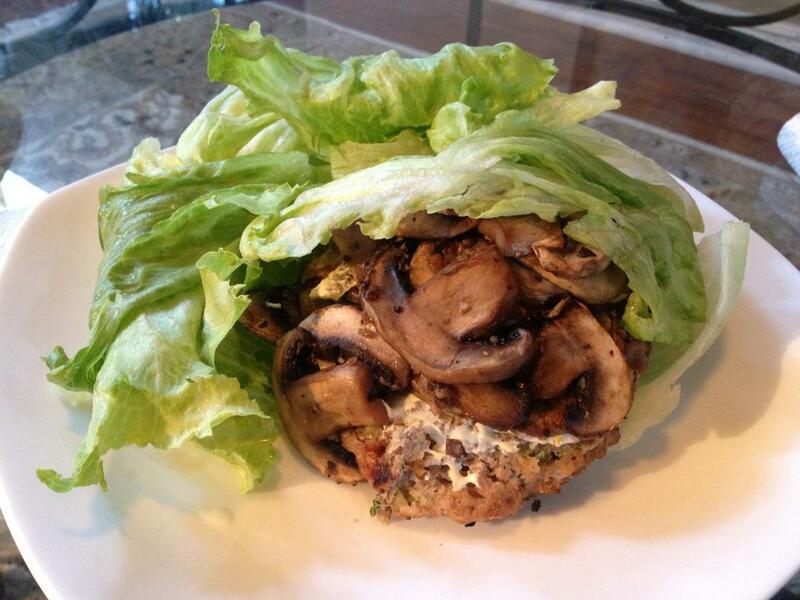 You gotta try this Turkey Burger we made… && YES!!! Ideal Protein Diet APPROVED!!! Day 5: I have lost 7 lbs, and my blood pressure has dropped from 144/86 average to a 113/76 average – I’m loving it!! Just a note to our dieters, please remember to use your salt with your meals, it is extremely important. I didn’t beleive it myself when they told me that my blood pressure would drop and that I would actually have to add extra salt to my meals, but it is very true! Last night I had a horrible headache, checked my blood pressure and it had dropped all the way to 100/69… then I thought about it, I hadn’t added any salt to any of my meals throughout the day, so I took the advice of our Ideal Protein Trainer and mixed 1/2 a teaspoon with a glass of water and drank it. Within 10 minutes, my blood pressure went back to a healthy 113/76, and the headache had vanished! So, it does work! What an amazing program, thank you Ideal Protein! Where do I begin?! First of all I think my hubby and I really found our new passion and hobby. We both have always liked cooking, but now we have an audience, which makes it even more fun and exhilarating… For now were going to stick with the Ideal Protein Recipe Book so we can show each and everyone of you that although the ideal protein diet seems hard and strict, this makes it so much more fun and taste bud stimulating!!! I’m not going to explain the recipe, word for word, because I’m still waiting to hear back from the company to see if I’m allowed to be posting their full recipes, but I’d love to tell you everything else and give you the “gist” of it! Pretty much chicken breast sautéed in chicken broth and walden farms orange marmalade, which was interesting cuz it gave the chicken a nice refreshing citrusy flavor. If you haven’t heard of walden farms dressings, spreads and condiments, I’d highly recommend you get familiar with them. They have a huge selection of stuff, ranging from ranch dressing to peanut butter and marshmallow dip, all of which are no calories, no fats, no carbs, no gluten and NO SUGAR. Crazy huh?!? And when I look on the side panel, it looks like its made with pretty healthy ingredients. We will be carrying them eventually in our office within the next couple of weeks, but if you can’t wait til then, or don’t live anywhere close to where we’re located, you can find the brand in any sprouts/Henry’s supermarket. & if you don’t have one of those, check them out online http://www.waldenfarms.com. Sorry for getting sidetracked, but I thought that was very important and valuable information 😉 while the chicken was cooking we also had a few leek stocks steaming in chicken broth, which made them oh so tender and flavorful! 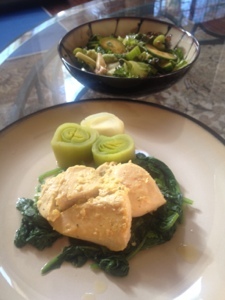 The final touch was the steamed bed of spinach, which really helped tie the flavors in nicely. On the side?! Small salad with the walden farms Italian sun dried tomato dressing.. Oh so delish! So there you have it, our nightly concoction! And we’re enjoying every minute of it! Please share this blog with all your friends and family, share the info, share the wealth. If you have any questions, what so ever, please feel free to ask! Day 4: Day 4 of the Ideal Protein diet..I have lost 6 lbs.. I am never really hungry, and I have lots of energy. Between now and day 5 or 6, your body is burning fat for energy. Let the melt down begin! I know I’m in ketosis because not do I have an abundant amount on energy, BUT my wife says my breath stinks. HAHA! Hopefully my patients won’t be offended by the smell too. This is completely normally and will subside. Day 3: I have already lost 4 lbs. The great thing about this diet is that it forces you to learn how to eat right and portion control. I have had less cravings for the wrong things and have had a lot more energy, especially in the p.m.. By the time you lose all the weight that you wanted on this diet, you will be a food Ninja and know how to combine foods together and still enjoy all the things you used to. It’s about living and still enjoying food, but also respecting your body! If you take care of your body, your body will take care of you! I highly recommend anyone who has been struggling with weight loss to come to one of our workshops! You will lose the weight and keep it off! Day 1-2: OK, I have decided to go on the Ideal Protein diet, with my first group of dieters, so I could experience it with them first hand. My goal is to lose 15 lbs. I am on day 2, and so far so good.